The Catholic Church teaches that punishment must have a constructive and redemptive purpose and that it be coupled with treatment and, when possible, restitution. Rehabilitation and restoration must include the spiritual dimension of healing and hope. Since the publication of the United States Conference of Catholic Bishops' 2000 pastoral statement on restorative justice, the conversation surrounding the need for criminal justice reform and restorative justice has moved forward. Redemption and Restoration responds from a Catholic perspective to help form an educational campaign to equip Catholics and their leaders to participate in the national conversation on this issue, create the programs needed to assist in healing the harm caused by crime, and restore our communities. The book develops the traditional Catholic understanding of justice, offers a theological understanding of restorative justice, explains how it can be implemented, and reflects on the practical arguments for restorative justice. Grounded in the stories of real people, Redemption and Restoration helps readers gain a deeper understanding of how this affects us all as a country and a church. It includes discussion questions to engage groups in exploring issues related to restorative justice. David Matzko McCarthy, PhD, is the Father Forker Professor of Catholic Social Teaching in the theology department at Mount St. Mary's University. He is the author of Death Penalty and Discipleship: A Formation Guide (Liturgical Press, 2016), co-editor of Where Justice and Mercy Meet: Catholic Opposition to the Death Penalty (Liturgical Press, 2013), and the founding editor of the Journal of Moral Theology. Vicki Schieber is a speaker, writer, and ambassador for Catholic Mobilizing Network and co-founder of Murder Victims' Families for Human Rights. As the mother of a murder victim, she is active in murder victim families support groups and a noted advocate for death penalty repeal. She is co-editor of Where Justice and Mercy Meet: Catholic Opposition to the Death Penalty (Liturgical Press, 2013). Trudy D. Conway is professor emeritus at Mount St. Mary's University. She is active in the Catholic campaign against the death penalty and contributes to the educational initiatives of the Catholic Mobilizing Network to End the Use of the Death Penalty. She is coeditor of Where Justice and Mercy Meet: Catholic Opposition to the Death Penalty (Liturgical Press, 2013). 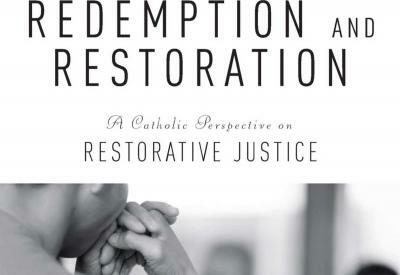 Now available for purchase, Redemption and Restoration: A Catholic Perspective on Restorative Justice can be ordered through the Liturgical Press website.